Matthew the Evangelist (Standard Hebrew and Tiberian Hebrew: Mattay or Mattithyahu; "Gift of Yahweh"—first century C.E. ), usually called Saint Matthew, was one of the Twelve Apostles of Jesus. He is credited with writing the Gospel of Matthew. Described as a tax collector working near the Sea of Galilee, Matthew responded to the call of Jesus while working at a local customs house. He then hosted a feast with his colleagues in Jesus' honor and immediately became one of Jesus' disciples. Given the authority to teach and heal, he preached Jesus' message of the coming Kingdom of Heaven and remained a faithful follower until Jesus' arrest, when he and the other disciples abandoned their master during his time of trial and his crucifixion. The New Testament describes Matthew as present at one or more of Jesus' post-resurrection appearances and at his Ascension. The Gospel ascribed to him does not claim to be written by "Matthew," but he has been characterized as its author since the second century. Modern scholarship now doubts that he was in fact the writer of this work. Several conflicting traditions exist concerning Matthew's supposed martyrdom. He is often depicted in art as writing his Gospel under the inspiration of an angel, and is also the subject of several famous works by Caravaggio. The name Matthew is mentioned five times in the New Testament: in Matthew 9:9, when he is called by Jesus to follow him, and four other times in various lists of the apostles. In Luke's and Mark's lists, he is mentioned seventh (Luke 6:15, and Mark 3:18), and in the Matthew and the Acts, he is mentioned eighth (Matthew 10:3, and Acts 1:13). Matthew is described as "sitting in the custom house," and apparently employed as a tax-collector (Matthew 9:9). Mark 2:14 and Luke 5:27 describe a similar person, a tax-gatherer named Levi, "sitting at the tax collector's booth," who is called to discipleship in a similar manner. Tradition makes this "Levi son of Alphaeus" identical with "Matthew." 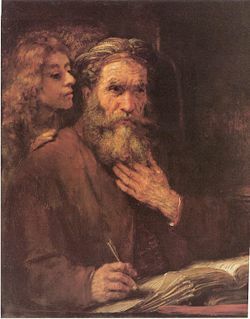 Few critics challenge the explanation that Levi was the original name of the man who was subsequently called Matthew. Other disciples, notably "Simon called Peter" were likewise given new names after they committed themselves to following Jesus. Indeed, having two names was a frequent occurrence among the Jews of this period. In many cases, a person went by both a Hebrew name and a Greek name. The later Christian leader Paul (Paulos), was originally called "Saul," while the high priest Caiaphas' Hebrew name was Joseph. Both of Matthew's names, however, are Hebrew. Thus Levi could have been his tribal affiliation and Matthew his given name. Levi was one of the sons of Jacob, while Mattathias (Matthew) was the initiator of the Maccabean revolt and the patriarch of the clan of the Maccabees. The name itself means "gift of Yahweh." Since Levi-Matthew worked near the Sea of Galilee (Mark 2:14), it is thought that this must have been his place of residence and birth. However, a tradition preserved by the early church historian Eusebius (fourth century) informs us that he was in fact a Syrian Jew. As a tax-gatherer at Capernum (modern Kfar Nahum), he would have collected customs duties for Herod Antipas, the Jewish tetrarch of that region who ruled at Rome's pleasure. Men of this profession were often despised by their fellow Jews, especially the Zealots and those Pharisees who followed the strict teaching of Shammai regarding relations with Gentiles. When summoned by Jesus, Matthew is pictured as simply arising and following his new master. Whether the two were previously acquainted is a matter of speculation. 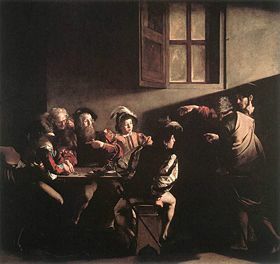 Apparently a man of some wealth, Matthew immediately hosted a dinner for Jesus at his own home, at which many of his colleagues and other "sinners" (probably meaning non-observant Jews) attended, as well as an unknown number of Jesus' disciples. Certain members of the Pharisees objected to a professed teacher like Jesus allowing himself to appear in such company, asking, "Why does he eat with tax collectors and sinners?" This prompted the famous reply: "It is not the healthy who need a doctor, but the sick. I have not come to call the righteous, but sinners." (Mark 2:17) The account in the Gospel of Matthew uses this scene to introduce Jesus' quotation from the prophet Hosea: "I desire mercy, not sacrifice," (Hos. 6:6) which this Gospel again reports Jesus as saying in a dispute over picking grain on the Sabbath (12:7). As one of the Twelve, Matthew ceased working as a tax-collector and followed Jesus. He is mentioned as being among those whom Jesus gave authority to teach, heal, and perform exorcisms (Matt. 10). He and the other disciples were commanded by Jesus to teach that "the Kingdom of Heaven is near." This phase of Matthew's discipleship meant giving up all worldly goods: "Do not take along any gold or silver or copper in your belts; take no bag for the journey, or extra tunic, or sandals or a staff." (Matt 10:9-10) Matthew and his colleagues were not to stay in inns but to accept hospitality from any "worthy person" who offered it. They are also instructed: "Do not go among the Gentiles or enter any town of the Samaritans," a command mentioned only in the Gospel of Matthew (10:5-6). Matthew seems to have accompanied Jesus in his ministry up to the time of the Last Supper. He was not present when Jesus was arrested at the Garden of Gethsemane, where Jesus was accompanied only by Peter, John, and James. His actions during Jesus' trial are not reported, and it must be assumed that he is included in Mark's blanket statement: "Then everyone deserted him and fled." (Mark 15:5) Like the other disciples, he did not appear at Pontius Pilate's home in support of Jesus, thus enabling the followers of Barabbas to secure their leader's release while Jesus was condemned. Nor was he present at the scene of the crucifixion. After Jesus' death, Matthew retreated to the Galilee (Matt. 28:16), where he became one of the witnesses to Jesus' resurrection. Later, he was among the apostles in Jerusalem said to be present at the Ascension and the election of another "Matthew" (Matthias) to replace Judas Iscariot among the Twelve (Acts 1:10-14). Matthew's career in the apostolic age is based on traditions of the Church Fathers as well as apocryphal and legendary accounts. Irenaeus of Lyon (late second century) tells us that Matthew preached the gospel among the Jews. Clement of Alexandria adds that he did this for 15 years. Eusebius maintains that, after writing the Gospel attributed to him in Hebrew, Matthew then went to other countries. Several writers mention an "Ethiopia" as one of the lands he evangelized, but locate this country south of the Caspian Sea, not in Africa. Others speak of Persia, Macedonia, and Syria. Clement of Alexandria quotes Heracleon, as stating that Matthew did not die a martyr, but all other testimonies of the Church Fathers say that he indeed died for his faith. There is wide disagreement in the sources as to the place of Matthew's martyrdom and the manner of his death, which is variously reported as being by burning, stoning, stabbing, or beheading. An account of Matthew's death in the Acta apostolorum apocrypha is considered legendary and probably originated in the third century. The Acts of Matthew begins with a vision given to Matthew of the child Jesus. Matthew asks Jesus concerning the whereabouts of King Herod I, and is informed that this evil king now dwells in Hades/Gehenna in eternal flames. At Jesus' command, Matthew goes to "Myrna," called "the city of the man-eaters," where he is to visit the church founded by Saint Andrew. After exorcising the king's wife and the son of a powerful demon, he meets Bishop Plato and performs various miracles, converting many of the heathen. Matthew's rod grows into a great fruit-bearing tree which feeds the multitudes of Myrna. The king, however, is outraged that his wife has become Matthew's disciple and resolves to have him burned to death. The fire intended to consume Matthew is miraculously turned against his persecutors and their gods. The king still does not relent, but after several more miracles, he destroys all of his idols and issues a decree that henceforth "there should not be many gods, but one, and one only, the God in the heavens." After Bishop Plato's death, the king, whose name is also Matthew, takes his place. A version of this story which appears in The Golden Legend preserves the less happy ending that the king, after his wife had determined to live the rest of her life in celibate chastity, dispatched a swordsman to slay Matthew. The executioner "came behind Matthew as he stood at the altar with his hands raised to Heaven in prayer, drove his sword into his back, and so consummated the apostle's martyrdom." Several writings are attributed to Matthew, the most famous being his supposed Gospel. This document is internally anonymous, meaning it nowhere claims to have been written by the disciple Matthew. However, the Church Fathers are unanimous in the opinion that Matthew is indeed the author, and this tradition is in evidence from as early as the second century. Textually, the inscription "Gospel according to Matthew" dates to the fourth century. Scholars began to express doubts as to Matthew's authorship of this Gospel in the eighteenth century, and today the majority of scholars agree that Matthew the disciple probably did not write it. It appears that Greek, not Hebrew or Aramaic, was its original language. The view of most modern scholars is that Mark's Gospel was the first to be written, and that Matthew and Luke represent independent updatings of his work for their particular audiences. Traditional Christians, however, generally accept Matthew's authorship of "his" Gospel. As late as 1911, the Pontifical Biblical Commission affirmed that Matthew was indeed the first Gospel written and that it was written in Aramaic. The report of the same commission to Pope John Paul II on April 23, 1993, however, takes a much less definite approach. Various other writings have also been attributed to Matthew. One of these, the De Ortu beatæ Mariæ et infantia Salvatoris—also known as the Gospel of Pseudo-Matthew—appears to be merely a later, abridged version of the second-century Infancy Gospel of James. Matthew is recognized as a saint in the Roman Catholic, Eastern Orthodox, Lutheran, Anglican, and other churches. The Latin Church celebrates the feast of Saint Matthew on September 21, and the Greek Church on November 16. In Orthodox tradition, he is additionally commemorated together with the other Apostles, on June 30, the Synaxis of the Holy Apostles. 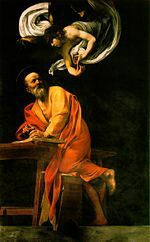 Like the other evangelists, Matthew is often depicted in Christian art with one of the "four living creatures" of Revelation 4:7. The one that accompanies him is in the form of a winged man, or a traditional angel. 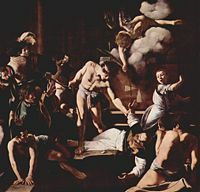 The three paintings of Matthew by Caravaggio in the church of San Luigi dei Francesi in Rome are among the best classic examples of Western art. Allison, Dale C. Studies in Matthew: Interpretation Past and Present. Grand Rapids, MI: Baker Academic, 2005. ISBN 9780801027918. Moir, Alfred, and Michelangelo Merisi da Caravaggio. Caravaggio. [Masters of art series]. New York: H.N. Abrams, 1989. ISBN 9780810931503. Riches, John Kenneth. Matthew. (New Testmament guides). Sheffield, England: Sheffield Academic Press, 1996. ISBN 9781850757412. Thiede, Carsten Peter, and Matthew D'Ancona. Eyewitness to Jesus: Amazing New Manuscript Evidence About the Origin of the Gospels. New York: Doubleday, 1996. ISBN 9780385480512. Westerholm, Stephen. Understanding Matthew: The Early Christian Worldview of the First Gospel. Grand Rapids, MI: Baker Academic, 2006. ISBN 9780801027383. All links retrieved September 25, 2014. This page was last modified on 25 September 2014, at 16:24.